The Muslim prayer room on campus has been broken into five times over the summer, Naaman Zhou reports. The scene in the room. CW: This article contains instances of Islamophobia. The Muslim students prayer room has been broken into five times in the past three months, despite multiple reports to University management. At 10am on Monday morning, Muslim students entered their prayer room in Old Teachers’ College to find it had been ransacked, with a racially abusive letter left at the door. The room had been trashed, with wardrobes and cupboards emptied and rubbish strewn on the floor. 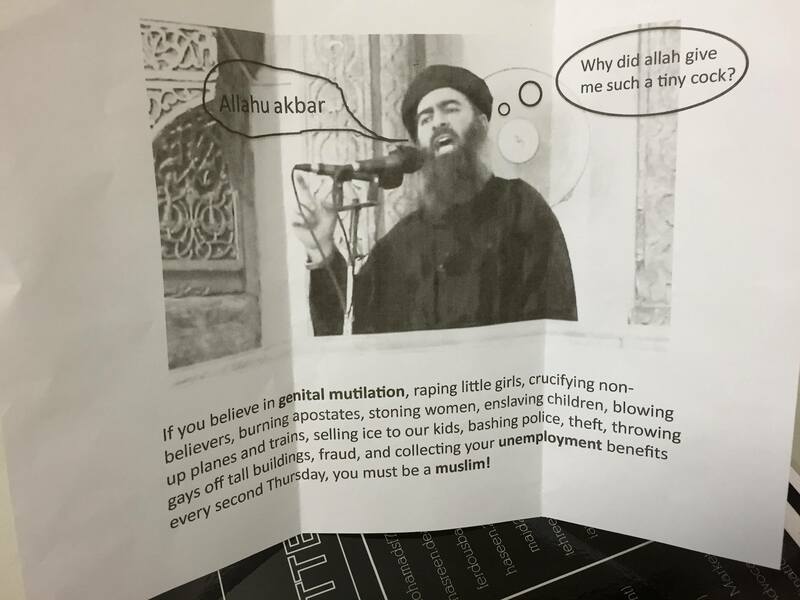 The letter left contained a picture of ISIS leader Abu Bakr al-Baghdadi and claimed Muslims were responsible for “selling ice to our kids”, “bashing police” and “theft”. Monday’s incident was the fifth break-in in three months, following four previous incidents between December 11 and February 1. It comes two weeks after Islamophobic graffiti was found in the Sydney University graffiti tunnel. Honi understands campus security have been aware of the incidents since December, and Director of Student Support Services, Jordi Austin, was informed in January. Undergraduate student Samiha Elkheir was the first to discover Monday’s break-in. “This happens so frequently that I check with campus security every day before I go in. I know it has been trashed multiple times before,” she said. President of the Sydney University Muslim Society, Nasreen Dean, told Honi police from Newtown Local Area Command attended the scene by midday. The police informed students there was no sign of forced entry. Nothing has been reported stolen. Campus security had earlier told Elkheir the door had not been closed on Friday evening, leaving it open all weekend. Security noticed the door was open at 6am Monday, by which time the room had already been ransacked. Police are examining video footage and seized the racially abusive letter for fingerprint testing. A spokesperson for NSW Police declined to comment on the break-in, but confirmed that a police report had been filed. Students told Honi the break-ins occur more frequently over summer because Old Teachers’ College closes at 5pm, yet many students stay after hours because daily prayers do not finish until after sunset. It has become customary for campus security to leave the door unlocked. “If nobody closes the door behind them”, said Elkheir, “there is a near one hundred per cent chance it will be trashed”. January saw two separate ransackings only one day apart. One, on January 20, involved the culprit cutting a lock to the room’s sealed wardrobe. Another involved the alleged theft of $70 from a donation box. Vice-Chancellor Michael Spence has told the affected students he is “very distressed to read that the community has been experiencing this level of hostility”. Spence also offered an in-person meeting to those affected. Dean told Honi that this had the potential to disrupt the evening prayers further. Affected students said they had emailed Austin on January 22, after a break-in on January 20. Austin said she was “dismayed to hear there had been a series of incidents over summer”. “I have asked the security team to review their incident reports to see if we can identify any patterns of behaviour here,” she said. Another break-in occurred nine days later. On Tuesday, three officers returned to the scene to inspect security cameras in the corridors of the building. By then, students had returned to business as usual, using the prayer rooms, chatting and making showbags for OWeek. Anyone with further information can contact Crimestoppers and the Islamophobia Register Australia.